While Byron Buxton, the top ranked prospect in the Minnesota Twins organization (and arguably in all of professional baseball), was named the 2013 Minor League Player of the Year by Baseball America on Wednesday, the question looms as to which prospects could have been considered viable selections (in lieu of Buxton) for the honor. By no means am I discrediting the performance that Buxton has displayed throughout the minors in 2013, as he has clearly exhibited the skills and tools worthy of player of the year recognition. Rather, I would like to take the opportunity to shed light on a prospect who has not only demonstrated phenomenal abilities at the plate this season, but projects to be a legitimate threat at the big league level within the next year. That particular prospect in Javier Baez, the top ranked prospect in the Chicago Cubs organization and the possessor of one of the most powerful bats in the minor leagues. Since being selected with the ninth overall pick in the 2011 MLB Draft, Baez has progressed smoothly, yet quickly to the Double-A level. After a solid 74-game stint with High-A Daytona, Baez was promoted to Double-A Tennessee in early July where he has continued to rake balls and drive in runs at a stunning pace. In 54 games with the Smokies, Baez has not only belted 20 home runs and driven in 54 runs, but has hit for average and lowered his strikeout rate. Through 130 games with both squads, Baez has mustered up an impressive stat line consisting of 37 homers and 111 RBI, along with an OBP/SLG/OPS line of .341/.578/.920. Although it can be argued that Baez has the highest ceiling in the Cubs organization, questions have surrounded his overall feel for hitting and plate discipline, which can be described as overly aggressive and impatient. Nevertheless, Baez was amongst the finalists for Minor League Player of the Year and for good reason, as the Cubs prospect can flat out hit with authority. The following is a scouting report of Baez, defined by a compilation of information gathered from professional scouting assessments and reports that have been conducted on the Cubs top prospect. Included are both present and future grades on five primary tool categories, ranked on a numerical scale between 30 and 80 that suggest overall future potential. Accompanying each grade are notes detailing both the specifics of Baez’s tool and the rationale behind the grades assigned to that tool. Notes: Baez possesses great arm strength and is consistent in terms of accuracy, both of which have allowed him to make up for the fielding struggles he has encountered at shortstop this season. His arm strength will allow him to make an easy transition to third base if the Cubs feel that such a move would be both beneficial and necessary for his continued success. If the situation arose, Baez has the arm strength and sound throwing mechanics to make the conversion to the outfield. Notes: Although he possesses a strong arm and good hands, Baez has often times struggled at short this season. He has flashed signs of displaying solid range, but has failed to maintain consistent mechanics in terms of fielding the ball. Baez appears to let his head get too much into his defensive fluidity, which has caused him to lose mechanical rhythm and as a result, try to do too much. As a result, he has committed one too many errors. If he is unable to pull it together mechanically at short, expect the Cubs to move him to third (which may present a future dilemma with the recent arrival of Kris Bryant). Notes: Baez possesses some of, if not the best bat speed in the minor leagues, which in combination with smooth, level swing has garnered him strong comparisons to the likes of Hanley Ramirez and Gary Sheffield. Like Sheffield, Baez has adopted a definitive bat twitch before each pitch, which allows him to bring his hands back and time the pitch. However, he has made the mistake of continuing the twitch as the pitcher delivers the ball to the plate, which has thrown off his timing and has made for poor contact. He has an aggressive approach to the plate, wherein he employs a hard swing that he can fail to adjust according to pitch and location. Despite his need for improvement in terms of plate discipline, the projectability is present. Just watching the way that the ball jumps off of his bat is rather breathtaking, which suggests the amount of natural ability he possesses. 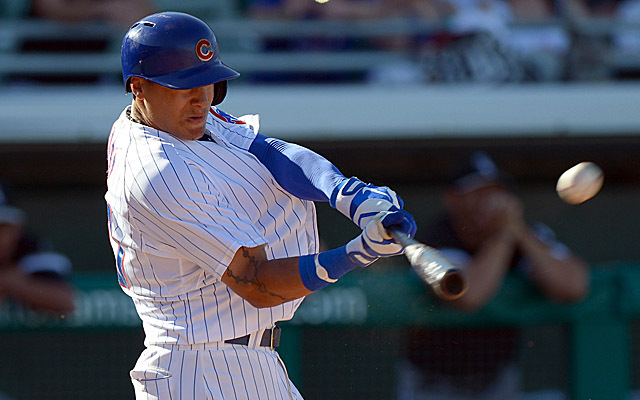 Notes: Baez has exceptional power potential, which he has clearly showcased throughout the minors this season. His incredible bat speed, strong hands, and body torque allow for the ball to jump off of his bat, which he can drive to all fields with relative ease and authority. He appears to have adapted well to the pitcher-friendly Southern League, having slugged 20 homers with a .638 SLG in just 54 games. He has shown improvement in terms of plate discipline since his promotion to Double-A, but much more improvement is needed for him to succeed at the next level. With better plate discipline will come a better feel for hitting and increased power consistency. Notes: Baez has average base running skills and solid speed, which in combination with his natural instincts on the field allows him to possess average range on either side of the ball. He swiped 24 bags last season and 20 thus far in 2013, which should provide the Cubs with an all-around power threat who has the ability to flash speed when needed. Based on the above assessments, Baez projects to be an above average to potential all-star caliber player at the next level, although his questionable plate discipline and defensive struggles will need to be resolved before making such lofty claims. 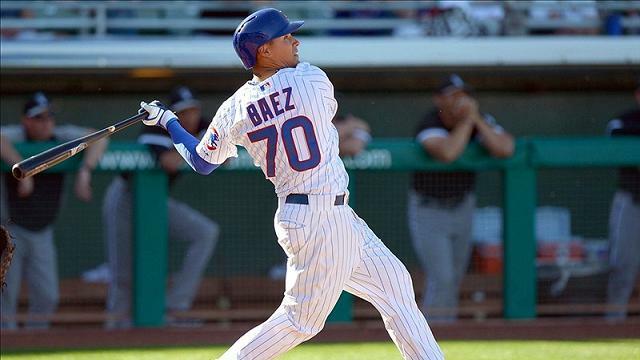 Baez has the skills and tools to become a star in the big leagues, but his plate discipline (which is defined by an aggressive, free-swinging approach that has resulted in his inability to establish a definitive strike zone) may prove to be the one thing holding him back from reaching his full potential. Whether or not the Cubs organization can further develop him into the next slugging superstar is yet to be seen, but based off of Baez’s recent success at the Double-A level, the outlook appears promising.